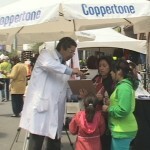 During the street fair this past summer, Coppertone set up a booth, complete with people in lab coats (not doctors) “testing” the skin of passers by. While New Ad Media and the St-Laurent street merchant’s association permitted this dubious branding of our historic street, we didn’t. We showed up to demonstrate for them theatrically just what was wrong with the situation. Have a look at what happened and see the video. 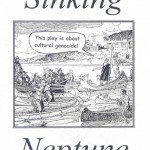 Sinking Neptune is a dramaturgical analysis and critical deconstruction of the “first play” ever written and produced in the so-called “New World”: Marc Lescarcot’s The Theatre of Neptune in New France. It is Canada’s first piece of Euro-centric art, literature, and drama. It premiered at the first Montreal Anarchist Theatre Festival, was performed again as part of Montreal’s infringement Festival in 2006, and a longer version of this work-in-progress was mounted for an extended run at Les Artistes du Toc Toc in Montreal. It was presented in Annapolis Royal, Nova Scotia on its 400th anniversary; November 14th, 2006. Subsequent performances were held at the BUS STOP theatre in Halifax. We re-worked the script and brought it back to deal with another colonial celebration, the 400th anniversary of Quebec City in 2008, performing in Montreal at McGill University, CEGEP Montmorency and the infringement Festival, in Guelph, Ontario at the University of Guelph and at l’Agitée in Quebec City. On Monday, December 3rd, Donovan King burnt the Montreal English Critics Circle Award (MECCA) he received for directing Call Me outside of the 2007 MECCA Ceremonies. Click here or the picture for more. This Buy Nothing Day, OTL and uberculture Concordia performed a culture-jam protesting Chartwells monopolization of food services at both Concordia and McGill Universities. Please click here or the picture for more, including videos. OTL hosted the Montreal portion of an international theatrical effort spurred by the censoring of My Name is Rachel Corrie by the New York Theatre Workshop. Click here or the picture for more. We performed in the Echec a la guerre anti-war march in Montreal, part of a global protest against the third anniversary of the invasion of Iraq. Our Stephen Harper greeted reporters and dealt with a protestor who snuck onto the flatbed truck where he was holding a news conference to celebrate his return from Afghanistan. He sent CSIS agents into the crowd to distribute insecurity certificates. On Buy Nothing Day 2006, Optative Theatrical Laboratories’ planned culture jam of American Apparel was infiltrated by undercover AA employees posing as activists. This led to a completely different scene that featured guest performances by Maurice Charney and the Montreal police. Click here or the picture for the whole story, including pics and videos. Optative Theatrical Laboratories joined this global action against the occupation of Iraq and sent dead soldiers to the US consulate demanding to know why they had been killed in support of the War Resisters Support Campaign. Click here or the picture for more, including the soldier’s letter, press and video. During the 2005 infringement Festival, OTL rented the newest activist tool, the TV-B-GONE, which has the power to switch off any television.